Out in the remote, high desert of Arizona is a place of worship that has served the community on the Navajo reservation for many years. The Church of God outreach, Klagetoh Shelter Mission, is a guiding light for believers of all generations of local Native Americans. Pastor Ron Woodman has been involved in ministry for over forty years, and officially became the pastor at Klagetoh Shelter Mission in 1992. 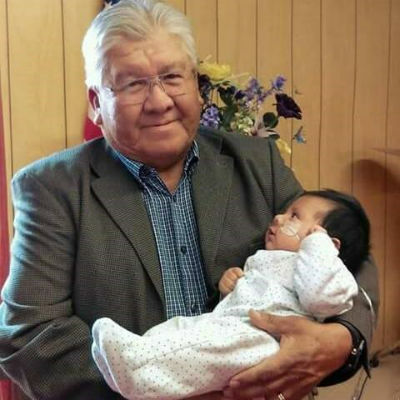 Since his ordination in Phoenix in 1973, he has been serving people living on the reservation through numerous ministries helping to speak truth and love into sometimes desperate situations. Photo: Pastor Ron Woodman holds his grandson. Pastor Woodman serves today alongside his sister Maureen Woodman, who also serves as first chief for the American Indian Council of the Church of God. The mission they lead together adapts to whatever capacity the people need. 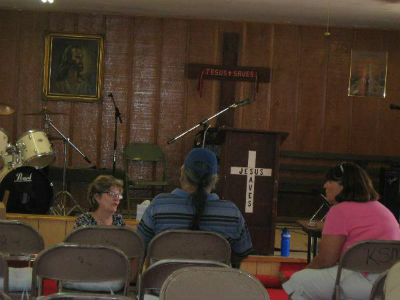 Klagetoh Shelter Mission is a place for outreach ministries, revivals, and community services. There are services every Sunday morning, along with special services for Thanksgiving and Easter. Much of Pastor Ron’s work revolves around intercessory prayer. He regularly receives phone calls from members asking him to pray for their families. Whether at a Sunday worship service or a funeral, prayer is central to the work of Klagetoh Shelter Mission. Pastor Woodman’s life has been closely tied to the history of the Mission. When he was about thirteen years old, his parents started hosting prayer meetings in various houses, until the group moved to the place where the church is now located in the early 1970s. In 1971, Pastor Woodman rededicated himself to the Lord and was filled with the desire to help young people come and be saved. His goal was to start a youth revival in the area and put together a shelter for youth revival services. Once he received his ministerial license, he rejoined his father to serve at Sunday services and revivals by recruiting young people his age from the community to join the congregation. As Pastor Woodman got older, he started teaching a Sunday school class for adults and led Vacation Bible Schools during the summer. It wasn’t long after that when he became the pastor of the Mission in the footsteps of his father. 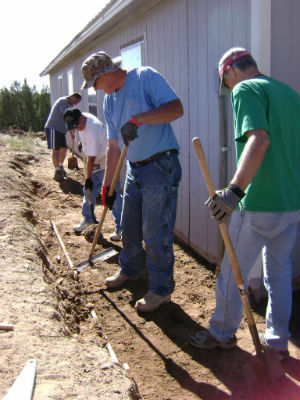 Photo: Work team from Glendale, Arizona’s West Side Church of God at Klagetoh in 2011. “It’s my desire to minister to my people any way I can. I know that God can help me because, when I depend on God, he always finds a way to support the ministry.” Continuing the work that his father poured into, Pastor Ron works very hard, ensuring that Klagetoh Shelter Mission can help more and more Native Americans today and into the future. Pastor Woodman has requested that the rest of the Church of God movement would pray for the finances of Klagetoh Shelter Mission so they can help more people in the community. He also asks that the movement pray for his health, as well as the health of his wife Effie. Finally, he requests prayer that donations would come in for a special event they would like to host during Christmas to bless their needy community with gifts. To support the work of the Klagetoh Shelter Mission Church of God, mail your donation to Church of God Ministries, PO Box 2420, Anderson, IN 46018. Be sure to write Project 43.44355 on the memo line. Or, make your donation by phone at 800-848-2464. Learn more about the Church of God at www.JesusIsTheSubject.org. Emily Ploetz is Anderson University student serving as communication intern for Church of God Ministries. This entry was posted in All Church of God, Home Missions, Western and tagged Arizona, Emily Ploetz, home missions, Klagetoh, Klagetoh Shelter Mission Church of God, Maureen Woodman, Native American Ministries, Navajo, reservation, Ron Woodman. Bookmark the permalink.